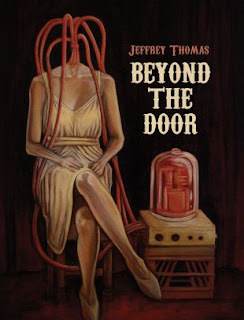 Beyond the Door is the next release in the Delirium 2011 Novella Series. Two strangers meet in a train station, and begin swapping stories—stories that eerily interweave, and grow more and more disturbing and bizarre. The headless undead, a gruesome flea circus, flesh-eating insects, and a menacing house that won’t stay put. These are just some of the tales that will reveal as much about the teller as they do the mysteries behind that frayed curtain we call reality. When Ware mistakenly opens an occupied stall door in a train station restroom, he's quick to show his annoyance by telling the stranger, "Where I come from, people lock the toilet stall door." The stranger retorts, "Well, where I come from, people knock on the door before they open it." The replies continue in this manner until the reader is figuratively sitting around a campfire listening to bizarre town stories of ghost train rides, traveling carnivals, and legendary citizens. The stories between Ware and the stranger last through the night and build to a story as eerie and atmospheric as Dracula picking off the seamen of the Demeter one by one. BEYOND THE DOOR is a story about how we connect with one another through storytelling—and tantalize ourselves with the unknown. Hi, newest follower here. Thanks for following me as well. I will definitely check this out. I remember a horror movie when I was really, really little called Beyond The Door. I never saw it, but I remember the commercials! I love that title - Beyond the Door. It immediately builds suspense for what's to come. That cover really creeps me out! Thanks for the introduction. Excellent. I should be getting the signed/limited hardcover in the mail any day now. Looking forward to reading this! Lee - I'm totally jealous of you. You're welcome, Jeffrey - thanks for writing it! Hmm.. I'm going to have to look up that old movie - I'm just not remembering it!